Last week I discussed Timmy’s freshman year and his first summer as a high school athlete. This week I will cover Timmy’s full sophomore year and part of his junior year. As I have mentioned in past lessons, Timmy is a good student and athlete who just happens to make silly mistakes during his recruiting process. We want you to SPOT THEM and CORRECT THEM. It’s August again and Timmy is back in shoulder pads for the first time since spring football. Everyone can tell Timmy is excited; this moment is all Timmy spoke about even though he spent the entire summer chilling out and playing with friends. Timmy learned from his first year of football making the varsity squad and getting decent playing time. He has become diligent in keeping his personal statistics. 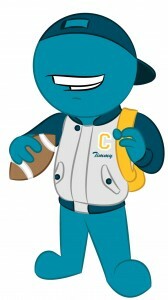 By the end of football season Timmy had earned a starting position with his team and was slowly becoming a fan and media favorite. This excited his parents, they thought the more Timmy was featured in the newspaper, the more coaches were going to notice him. As Timmy ventured into basketball season he felt disconnected with the sport subsequently affecting his playing ability and statistics. Unfortunately this continued throughout the season causing Timmy to ride the bench quite often. Timmy decided to give Track a try during the spring and forwent an opportunity with the varsity baseball team. He was happy with his decision until he pulled his hamstring running the 400 yard dash at a meet. This injury ended his track season and ended his opportunity to attend any combines, tournaments, or showcases during the spring and early summer. As mid-summer approached Timmy was back to full health with football on his mind. He decided to join some of his teammates at a few football camps. Not knowing much about the camps other than which ones his teammates previously selected, Timmy went all in. Upon returning from the camps Timmy felt he was a better football player and was hoping his new “skills” would show this upcoming season. Timmy’s skills came through having a breakout junior campaign! Timmy was one of the best players on his team, he had the stats, and he started getting form letters from schools ranging in division; Timmy thought his time to be recruited had started… his dreams were coming true! He thought he might start to contact coaches after the season but for now since he was getting letters they were obviously interested in him. I featured 7 mistakes in this week’s lesson. As with all of Timmy’s lessons, I ask that you recognize and correct the mistakes in the comment section of this blog. Correction- As highlighted in Lesson #2 mistake #4, Timmy should have devised a plan for classes by this point. Correction- Highlight films are an important aspect of recruiting and should be taken seriously, proper game film should always be kept. Correction- If professional video footage is not an option then a parent should either be filming or cheering , not both. Correction- While time off is important, athletes with dreams of playing college sports should spend their summer becoming better at their sport. For Timmy he should have been attending camps and hitting the weight room. Correction- You should never ignore the advice of your coach when he or she is trying to make you a better athlete. Cheerleading is close to be accepted as a college sport.